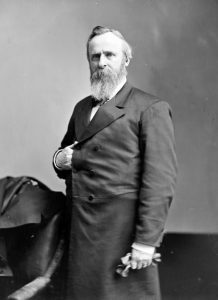 On October 4, The Delaware County Historical Society will hold a birthday celebration in honor of President Rutherford B. Hayes, who was born in Delaware on that day in 1822. 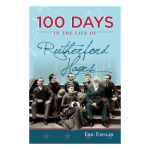 Author and Historian, Erick Ebinger will be sharing stories from the life of our 19th president, based on his 2016 biography “100 Days in the Life of Rutherford Hayes”. Preceding the program, at 6pm, there will be a Reception for DCHS Life Members at the adjacent Meeker House . This program is free and open to the public at The Barn at Stratford, 2690 Stratford Rd, which is handicap accessible with free parking. For a map and directions click here. The Meeker Homestead Museum will be open for tours before the program, at 6:30. The Society thanks Hilborn Insurance for sponsoring this program and for its long term dedication to preserving Delaware history.